Woman sews on the modern sewing machine. 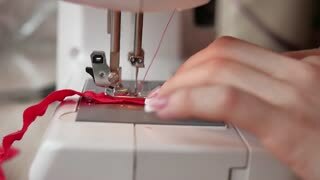 Sewing machine sews close up the action in slow motion. Happy father with a newborn. Young man kissing little baby lying on the bed. Family concept. Interior- Interior room design concept a view a hotel room with a comfy bed. Interior concept a view a hotel room with a comfy bed. Two boys, 4 and 2 years old, are watching TV sitting on the couch. An exciting TV show. View cartoons. Children watch an exciting TV show. A 2 years old boy sits on a sofa and watches TV sitting with a remote control in his hands.